"...Lucas County commissioners on Tuesday approved the project outline and estimated cost for a 0.6-mile-long asphalt trail addition from King to Silica roads. Worth Noting: East end of trail is .7-mile from Ottawa Park and its paved trails. A spur to Wildwood Metropark at roughly the midpoint of the bikeway, makes access to facilities and parking most convenient. We parked there and followed the paved trail over to the main bikeway, just outside the park. Much of the bikeway is bordered by fencing, sometimes on both sides of the trail. The construction varies from wooden privacy fence and split rail to chain link. Some sections are overgrown with vegetation creating lush green walls. The reason for much of this fencing is that about half of this bikeway spans residential neighborhoods, so you're literally pedaling along the edge of residents' backyards. Extensive fencing can sometimes give you a cordoned-off or an enclosed feel. But the 12'+ wide berth of the trail surface makes it easily bearable. The corridor cuts right through city neighborhoods. Some mature trees that shade the trail, along with well kept yards, make for inviting scenery along the way. There's a nice mix of shade and sun as well a curve or two to break things up a bit. The trail also passes a few small commercial sites and takes you onto the University of Toledo campus. The campus section has light posts and a few emergency call boxes. The adjacent railroad track here is clearly visible and parallels the bikeway along the edge of the campus. Both ends of the bikeway have connecting bike routes and there are several small spurs or connectors that link neighborhoods as well. The west end of the trail, at King Road, offers bike lanes along King and Sylvania Avenues. The east end, at the Toledo campus, has bike route signs that direct you to nearby Ottawa Park. There are mile markers and a couple of water fountains placed strategically along the trail, resulting in a very good overall layout. The bikeway has two street overpasses as well as a traffic signal for trail users to cross busy Holland/Sylvania Road. 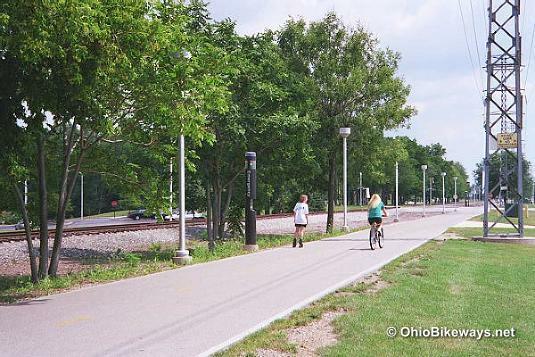 This well-traveled trail was constructed in 1995 and was one of northwest Ohio's early rail-trail projects.